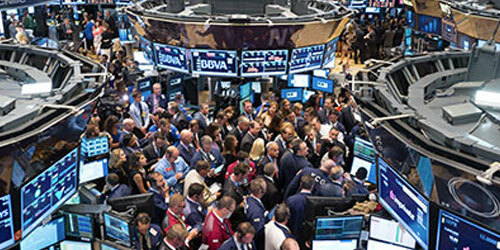 Most Americans invest in stocks, often via IRAs or pensions or mutual funds that invest for us, but I buy a modest amount of stocks, usually through a conglomerate of companies called an index fund. For example, I own a few shares of one of the many indexes based on the S&P 500, one of the main funds. Investment companies such as Vanguard and Fidelity offer electronically traded shares that track the S&P. Hundreds of millions of shares of the S&P are traded daily. The funds buy shares of those 500 companies that comprise the list of the country’s large corporations. I feel terrible that I’m buying shares in cigarette companies, gambling companies, war companies, and other immoral activities. But it’s more than that: we investors are telling companies how to run their businesses. Most of us have an insignificant amount invested compared to institutions, so they are not going to pay attention to me or the millions of others like me, but just by investing we’re making a statement. Investors are generally not interested in the company, only that their stock price rises. It’s a short-term thing. Investors buy and sell to turn a profit. Thus, by its very nature, investing is a disregard for the employees or the company’s practices. They want the CEO and the chain of hierarchy to perform better, for the employees to take home less money so we can make more money. Investing is no longer for the long term but an instant gratifier. In high frequency trading, which is estimated at being anywhere from 70 to 90 percent of all trading, sophisticated software buy and sell for large investors such as Goldman. They may hold shares for a few seconds, trying to make a penny or two on the trade. For the number of shares they trade, that’s a lot of pennies many times a day. As investors in funds, we are pressuring McDonalds not to raise wages for their struggling and hard-working employees. We may not voice this, but we want more profit. Or we’ll sell our shares and go somewhere else. Are we, by our participation, robbing low wage employees of a decent wage even though we philosophically believe they should be able to live well from their pay? But our investments speak a louder language. Socially responsible funds generally don’t do well because they don’t have big money or big managers. What’s the solution? I don’t know. Companies need us to invest in them so they can employ people. It’s right to invest in a company. A country’s employment and well-being requires that people invest, giving companies the ability to begin, grow, and hire. But I really wish we had a better and more just way of going about it. I think about that as well. The whole capitalist system is flawed, but so is the socialist system. I think government controls on excesses of corporations is important. I don’t want to invest in stocks, but I see your point–we all invest via third parties. Perhaps the best thing is socially responsible funds. I agree that the problem is capitalism itself because it has no morality, no soul, no sense of right or wrong, but even in other investing, such as real estate, we are faced with the same dilemma. We want to get the most out of our homes, so we want our neighborhood gentrified, kicking out the poor people who drive down home prices.